What I most like about soups is that they can be a well-balanced meal, a light one of course. It contains fibres and proteins I need. When I spotted the fresh and nice ling fillets on sale at Woolworths, I grabbed one large piece back home without hesitation, then whipped up this soup. The ling fillet is firm and won’t be easily broken apart along the way of cooking. Yet you can choose whatever fish fillet you like if you want to try out this soup. 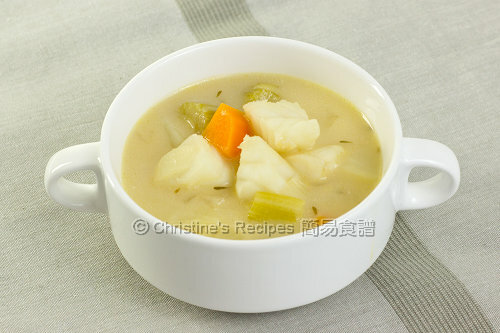 This creamy fish soup is delicious, and can be served with crusty bread. Rinse the fish and wipe dry with kitchen papers. Cut into chunks. Season with salt and pepper. Heat vegetable oil and butter in a large pot over medium heat until the butter is melted. Saute garlic and onion until the onion is translucent. 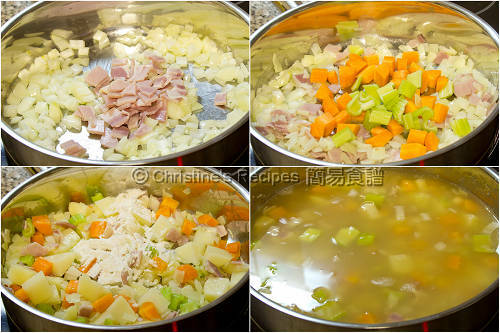 Add bacon, carrot and potato. Cook for a while. Pour wine over the vegetables. Increase heat to high. Continue to cook until the sauce reduced by half. Add celery and thyme. Sprinkle flour and stir to combine well. Pour stock. Bring it to a boil. 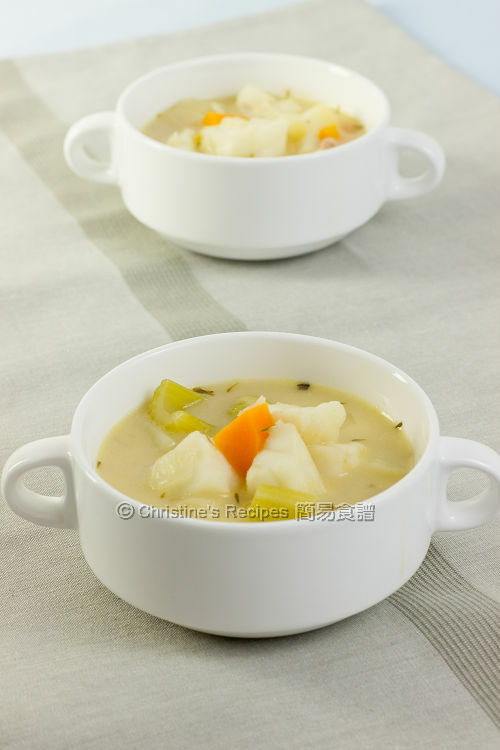 Reduce heat to medium low and cook until the potato is softened, about 10 to 15 minutes. Add fish and cook until turned opaque. Stir in cream and cook until close to boil. Remove from the heat. Season with salt and pepper. Serve with crusty bread or garlic bread. Use any white fish fillet you like, for example cod, snapper or ling filet. Whipping cream (pouring cream) is available at supermarkets. Thickened cream is good. But if using light cream, it easily becomes curdle when it boils. Make sure not to boil it after adding the cream. Made this for dinner tonight. It is wonderful! My husband and my two year old both loved it. There is no mention of carrot in your recipe but in your photos there seems to be some. I added some carrots in my soup tonight and it was great. Thank you for such a lovely and easy recipe. So glad that your family loved my recipe. Yeah, missed out the carrot on the ingredient list. Updated. With the fish, it just makes the soup well-balanced and complete as a light meal. What a delightful seafood soup! Excellent recipe! Thanks Christine! My family loved it!